THE NEW 24 MM VICE CRANKS! COMES WITH A MID BB! The new Federal Vice crank features a unique radius box section combined with a 24mm hollow 48 splined spindle to make these some of the strongest and stiffest bmx cranks on the market. The spindle and arms are both made from heat treated 4130 Chromoly and the spindle has been internally machined to reduce weight. The cranks are designed to take all the abuse of the modern street rider and the angular shape of the arms helps to make crank slides more stable. The embossed logo gives the cranks a unique and distinct appearance. The crank are Left/Right compatible and the spindle bolts can be used with either 6mm or 8mm allen keys. The crank comes complete with a high quality Federal 24mm Mid bottom bracket. 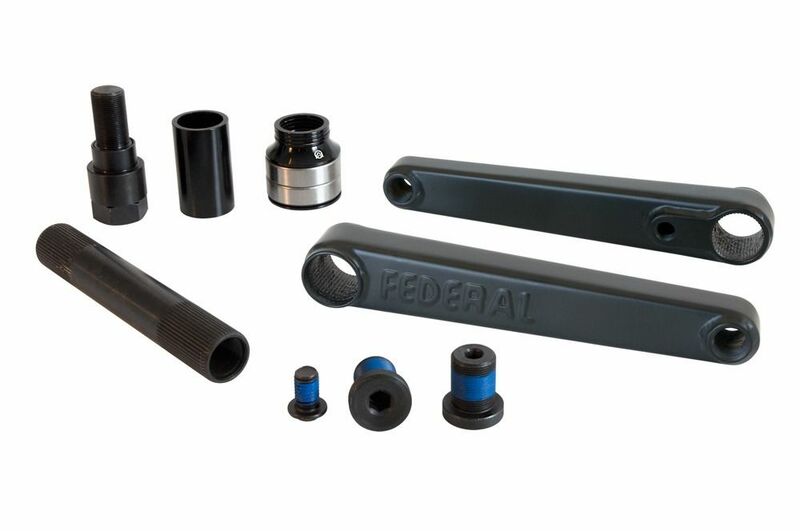 The Federal Vice 24 cranks are made from heat-treated chromoly with rectangular shaped arms to help stabilize crank arm grinds and a hollow 24mm spindle to maximize strength and stiffness. Additional features include wrap-welded spindle and pedal bosses, hollow chromoly spindle bolts and embossed Federal logos. The Vice 24 cranks are ready to handle some serious street abuse right out of the box. Includes a 24mm Mid BB kit with internal spacer, 2 cone spacers and multiple crank arms spacers to dial in chain alignment. RHD/LHD compatible.